Have you ever had to keep up with sunrise/set or moonrise/set times? Whether you are fasting or into lunar gardening, you shouldn’t struggle to get this information. 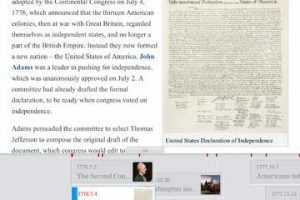 That’s why LunaSolCal for iPad is so handy. It provides you with all the relevant information on the sun and moon and also shows information on future moon events and important dates. 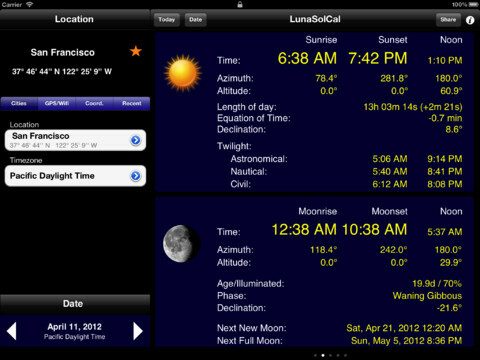 LunaSolCal has a clean interface and provides you with information on the sun and moon in an easy to follow fashion. 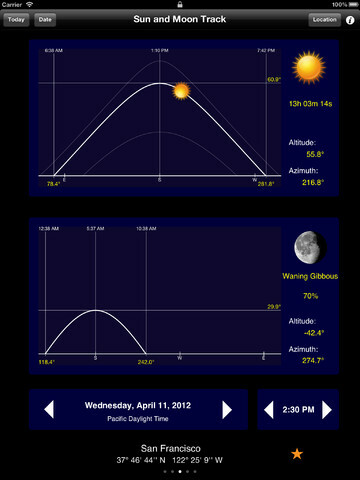 The app covers sunrise, sunset, day length, declination, solstice and equinox dates, and twilight information. 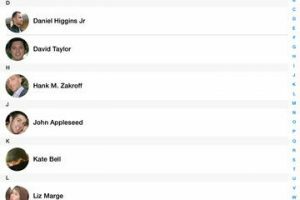 Moonrise/set, moon phases, distance, and date/time of the new and full moon are also covered. You can select dates from 1901 to 2099. LunaSolCal saves you time looking up useful information on the sun and moon. It covers plenty of cities in over 200 countries. This could prove useful if you need to keep up with sun and moon data.